DumpsRobert Robledo of Pasadena, Texas, broke out at our Houston Tour show with his ’63 Impala “Hood Rich.” This very tasteful convertible reps Robert’s club, Latin Kustoms C.C. of Houston. In fact, the club seems to be cranking out clean lowriders like an assembly plant. Robert and his friends broke out a few at the Houston show. Robert’s Impala is definitely an attention grabber, and the trunk is worth a look. 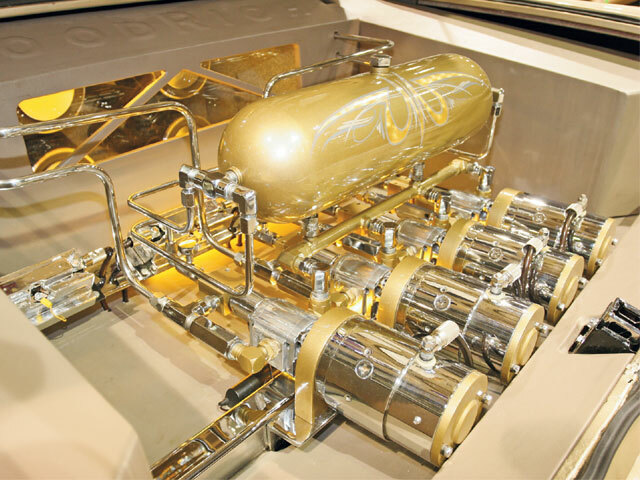 The Veterano hydraulics setup built by Shorty’s Hydraulics of Houston features four pumps to give the car all of the control it needs to three-wheel or adjust a cylinder individually. Robert and his crew, Danny Gonzalez and Pedro Trujeros, took a few weekends to plumb the Shorty’s setup and upholster it in order to get it ready for the Houston Tour show. The setup is powered by six 31-series batteries that are hidden behind the interior panels. This show setup was one of the factors that helped the car catch our attention at the Houston show. The setup is one of the more unique ones that we’ve seen recently. Nice job, Robert, and we hope to see more cars coming out of the Latin Kustoms assembly line in the future. PumpsAnother cool-looking cruiser from the Latin Kustoms collection of Houston, Texas, belongs to “Big Junior,” also from nearby Pasadena, Texas. 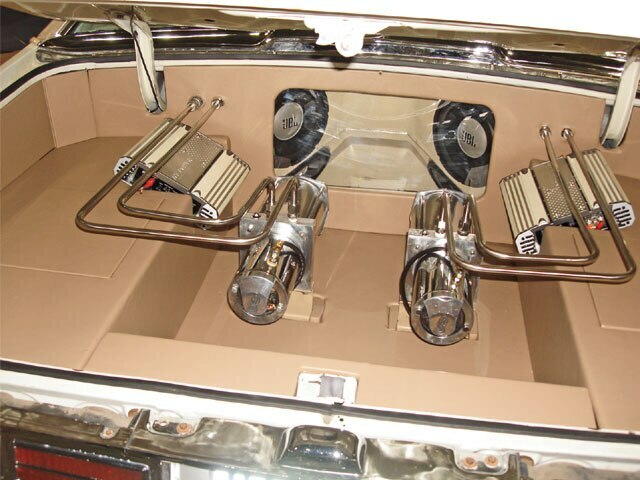 Big Junior wanted to be different with his hydraulics and sound system, so he hooked up with some of his buddies, did some brainstorming and started in on the trunk of his ’76 Chevy Caprice. The hydro setup consists of two chrome ShowTime Hydraulics pumps that were installed and hard-lined by Big Junior’s friends Robert, Michael and “Eazy.” The audio portion includes a pair of bass-boomin’ 12-inch JBL subwoofers that are housed in a custom Plexiglas box that was wrapped in vinyl to match the glasshouse’s interior. The boxed panels and interior kit were built by another friend in the club, Ricardo. The subwoofers are powered by two amplifiers that can be seen through a cut-out in the Plexiglas box. The small amplifiers are all that’s needed to make the subs work properly. There’s another four-channel amp in the interior that’s used for two sets of mids and highs. Big Junior and his team took advantage of the trunk space and installed eight 31-series batteries. This marriage of audio and hydraulics turned out beautifully, especially when you consider that Big Junior and his buddies did all of this work in a month to get it ready for the Houston show. Like we noted in the corresponding “Dumps” feature, Latin Kustoms really knows how to knock out clean cars. We can’t wait to see some of the club’s other rides when they’re completed.